TRENTON, N.J.—On Friday, Nov. 16, as part of the Vision 2028 Leadership Summit, the New Jersey Council of County Colleges presented the first statewide Community College Distinguished Alumnus Award to Salem Community College Alumnus Paul J. Stankard. The Distinguished Alumnus Award is presented to a New Jersey community college graduate who has made significant contributions in his or her profession and community that have brought honor to New Jersey’s community colleges and the State of New Jersey. Stankard was recognized for his unparalleled contributions to the field of glass art and his alma mater. In 1961, Stankard enrolled in the scientific glassblowing program at Salem Community College’s predecessor, Salem County Vocational Technical Institute. After graduating with a degree in scientific glassblowing, he spent 10 years in industry, where he became a master of fabricating complex instruments. In 1969, Paul started experimenting with producing glass paperweights in his garage while working in the industry to support his growing family. It was when Stankard displayed his early paperweights at a craft exhibit on the Atlantic City boardwalk that Reese Palley, an internationally respected art dealer, saw his work and sponsored Stankard financially to move full-time into making glass art. Over his 45-year artistic journey, Stankard has become an internationally acclaimed artist, pioneer in the studio glass movement, and is considered throughout the world as the father of modern glass art paperweights. His work is represented in more than 60 museums around the world, including The Smithsonian Institution in Washington, DC; the Metropolitan Museum of Art in New York; the Louvre in Paris; and the Victoria and Albert Museum in London. He has received two honorary doctorate degrees, one honorary associate degree and many awards within the glass community, most recently the Masters of the Medium Award from Smithsonian's The James Renwick Alliance and Glass Art Society’s Lifetime Achievement Award. He is an Artist-in-Residence and Honorary Professor at Salem Community College. In 2001, Stankard founded Salem Community College’s International Flameworking Conference (IFC). The IFC celebrates excellence in flameworking by exposing SCC students and conference attendees to many of the world’s leading glass artists using the flameworking process. Stankard became chair emeritus following the 18th annual IFC. During the mid-1960s, Paul Stankard was blowing glass flasks, beakers, vapor traps, and sundry items for scientific laboratories. Back in his own studio, a utility shed in Mantua, in the evenings and on weekends, he was creating small glass objects of visual delight. Now celebrating a career that has spanned more than 50 years, Stankard, 75, enjoys a critically acclaimed international reputation as an artist of exquisitely breathtaking one-of-a-kind glass sculptures. “Beauty Beyond Nature” is a retrospective of 63 objects and two botanical prints presented at the Museum of American Glass at WheatonArts in Millville. Running until Dec. 30, the exhibit is guest curated by Andrew Page, director of the Robert M. Minkoff Foundation, which has loaned the works on display. The traveling show has been seen at the Museum of Glass in Tacoma, Washington; Bergrstrom-Mahler Museum in Neenah, Wisconsin; Lowe Art Museum in Coral Gables, Florida; and the Hunter Museum of American Art in Chattanooga, Tennessee. Hence, this is a homecoming hosted by South Jersey’s premier museum, which has “the most comprehensive collection of American glass in the world” and is located about 32 miles from the artist’s studio. Since 2005, Robert M. Minkoff, a commercial real estate developer and philanthropist in Potomac, Maryland, has amassed a collection of 135 pieces by Stankard. 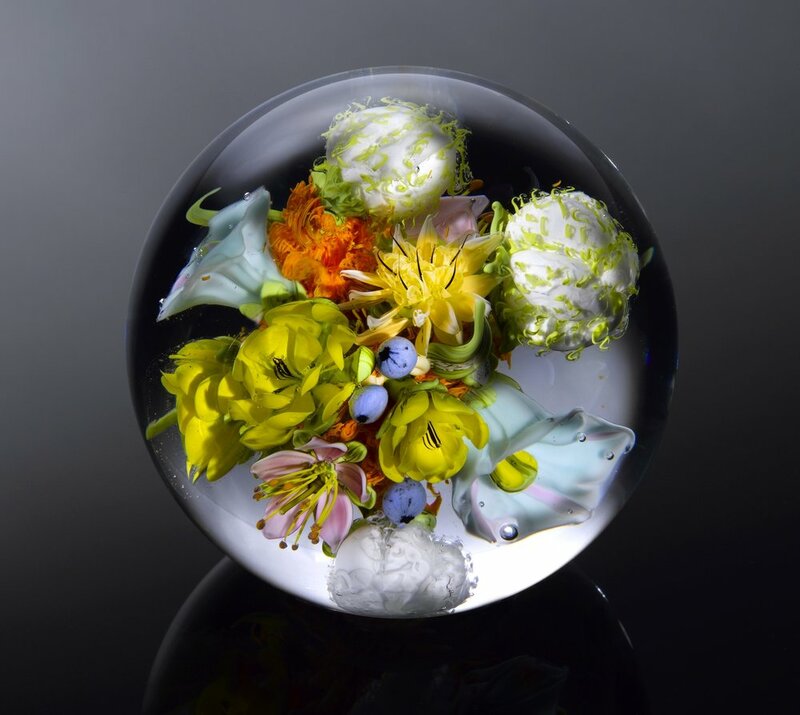 In an email, the collector wrote, “I've always been fascinated by paperweights and other encasements in glass art, but when I discovered Paul Stankard's virtuosic botanical compositions within glass volumes, I set out to not only acquire his most exquisite efforts, but to trace his progress from his earliest efforts to all the breakthroughs to collect his most masterful achievements." According to the curator, “This Paul Stankard collection is unique and definitive in its effort to be complete and to document an evolution over the years. It also marks a friendship” as Minkoff and Stankard share a deep respect for nature. In the museum’s “Jewel Box Gallery,” the intimate show is not strictly chronological but arranged by the various categories of the artist’s forms. With its 10 window cases, the presentation of Stankard’s signature small-scale work gives the visitor a feeling of looking at the Fifth Avenue windows of Tiffany & Company. His two largest pieces are the eight-inch orbs presented in freestanding vitrines. So the artist’s craftsmanship may be fully appreciated, flashlights to highlight details for better viewing are available at the nearby front desk of the museum. Just outside the gallery is a small sample of his early blown-glass scientific pieces, including student work done at Salem Vocational Technical Institute (now Salem Community College) in Carneys Point that has not been previously exhibited. At the opposite side are two beautiful glass plate prints (vitreographs) that Stankard had made in North Carolina while working collaboratively with Harvey Littleton, a celebrated pioneer of the American Studio Art Glass Movement. On a recent tour, Kristin Qualls, director of exhibitions and collections at WheatonArts, emphasized this exhibition documents “Paul’s amazing work that has evolved and developed over time with practice and patience of technique, ideas, and content.” Unquestionably, Stankard is an integral figure of the first generation of then emergent Studio Glass Movement that elevated glass as a contemporary fine arts medium. 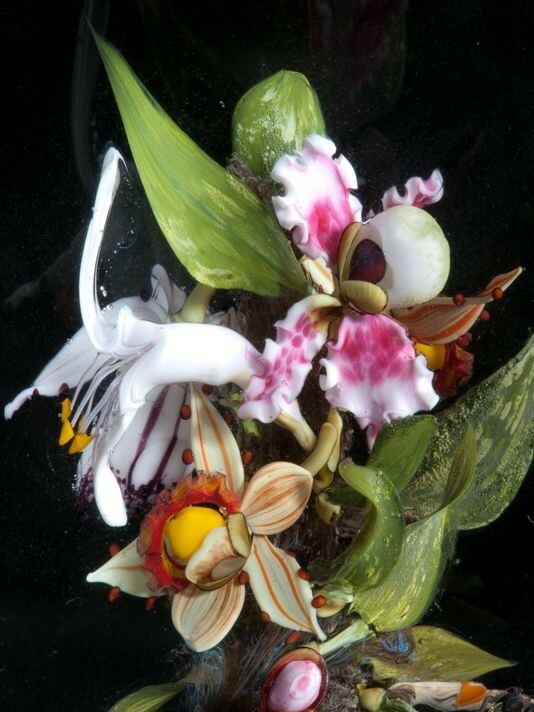 Stankard was born under the astrological sign of Aries with its element of fire, so it seems appropriate that he is a master of flamework, a process that uses a propane-powered torch to melt thin rods of colored glass creating still life designs for his distinctive paperweights, botanicals, orbs and various glass assemblages. Stankard’s formative childhood years were spent in southeastern Massachusetts before his family relocated to Wenonah 60 years ago. Yet in spite of his distinctive Boston accent, he is strongly rooted in South Jersey and respects the significant glassmaking tradition that goes back to the 18th century in Salem County and continues to this day. “Glass is the second largest employer in Millville,” according to Qualls. As a Jersey guy, he is also inspired by the region’s native flowers and has an enduring admiration for the poetry of Walt Whitman. Just as Stankard was preparing for the arrival of a fourth child, he made a life-changing decision with the endorsement of his wife to leave glassblowing at Rohm and Hass in Philadelphia and pursue a career as a full-time artist. Since 1972, there has been no looking back; his technical facility has certainly bolstered his subsequent success. His challenge was to take the Millville Rose, the first uniquely American paperweight dating back to the mid-19th century, and create a more personally relevant object. On display are 18 paperweights representing three decades since the early 1970s. While he strove to design botanical portraits, the initial resultant images were rather simplified. As the vegetation becomes more illusionistic, the flowers are actually interpretive and referential. Regardless, many may think they are real blossoms encased in the high-grade soda-lime glass. Unlike the traditional 19th-century paperweight that is seen just looking down at it, Stankard offers a more all-encompassing point of view. His small-scale sculptures are admired from both the top and bottom. They cannot be touched at the museum, but mirrors provide an opportunity to see the various artworks from varying vantage points. A Benedictine inspirational message is positioned directly above his workbench: “Laborare est orare” (labor is prayer). He calls Whitman his studio's "patron saint.'' Stankard cites a line from “Leaves of Grass” as a guiding principle that has personal resonance: “A morning-glory at my window satisfies me more than the metaphysics of books.” This may have added meaning, since the artist has suffered from dyslexia and is an experiential learner. In mid-June Stankard taught a workshop on flameworking at Salem Community College. He regularly shares his expertise and talent with a younger generation of aspiring artists. His work has inspired Leslie Kirchhoff, 27, a Los-Angeles based artist who creates Disco Cubes, high-end ice cubes with real herbs and edible flowers suspended in the center of frozen purified water for cocktail drinks. Stankard continues to work in his Mantua studio every day. He also enjoys spending time collaborating with the technicians at Wheaton, who are challenging him to go larger in scale. Fred B. Adelson is a professor of art history at Rowan University. 'Beauty Beyond Nature: The Glass Art of Paul Stankard' is on view through Dec. 30 at Museum of American Glass, WheatonArts and Cultural Center, 1501 Glasstown Road, Millville. Visit www.wheatonarts.org or (800) 998-4552 or (856)-825-6800. Tuesday through Sunday, 10 a.m. to 5 p.m. Artistic Risk and the Ticking Clock - Should an artist in his 70s confine himself to his comfort zone? One master says no. 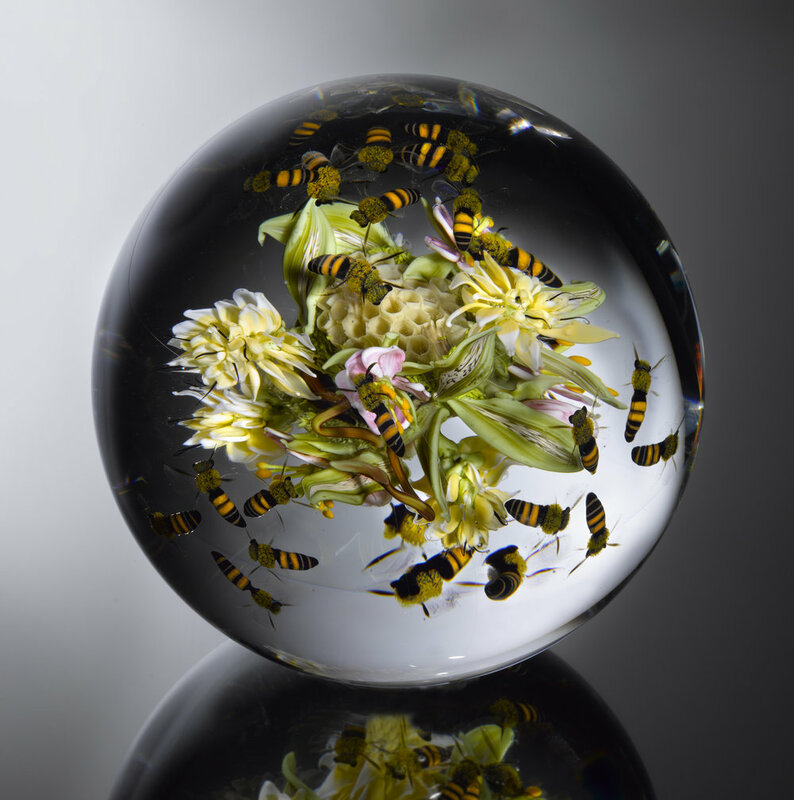 "...Paul Stankard, according to Queenth*, 'was one of the first contemporary glass artists to elevate paperweights to an art form.' Stankard is a living master, unrivaled. 'While flowers in nineteenth-century weights can be somewhat cartoonish,” she said, “his are always incredibly accurate, like botanical studies.' She pointed to Stankard’s bees. 'You can practically hear them buzzing.'" Chantel Tattoli is a freelance journalist who has contributed to the New York Times Magazine, VanityFair.com, the Los Angeles Review of Books and Orion.